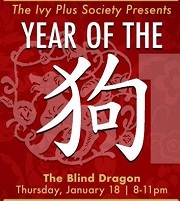 TIPS: The Ivy Plus Society is kicking off 2018 at the exclusive Asian inspired lounge, The Blind Dragon. A hidden gem located on the famous Sunset Strip in West Hollywood, The Blind Dragon has 4 luxury sing or die karaoke suites with over 25,000 licensed songs. Start The Year of the Dog off right by mixing and mingling with LA’s finest and brightest.